Swedish metal band Cut Up, we could say that they are a new band under the label Metal Blade Records, and they are proudly releasing their album debut "Forensic Nightmares" but before delving into this topic, let's learn a little more about this band, they come from Karlstad, Sweden and they formed at the beginning of 2014 by Tobias Gustafsson on drums , Anders Bertilsson on guitar, Erik Rundqvist on vocals/bass, Yes! 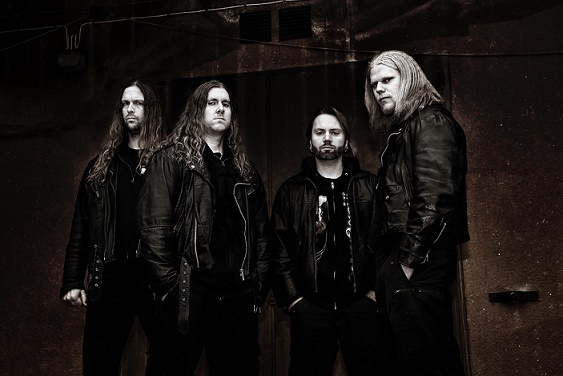 you got it, all of them were part of the extinct Vomitory, to complete the line-up is Andreas Björnson plays guitar/vocals and plays also for Fetus Stench, if these bands are well known by you then, I think that you can get a clear idea of the content of this album, if not; then get ready for what is coming to you, certainly this is a Death metal simple, pure, aiming at nothing other than dwell in Death metal roots to overcome adversities and gain respect. Not bad! Having said all that, is time to immerse yourself in this refreshing, bloody and ruthless production, which was recorded at Big Balls Production Studios in Sweden/Karlstad engineered by Mats Lindström assisted by Fredrik Färninger and Tobias Olausson, it was mixed and mastered by Ronnie Björnström in Garageland Studios, Umea/Sweden, Artwork & Layout by Łukasz Jaszak, photos by Soile Siirtola. "Forensic Nightmares" contains eleven tracks, two of them already have been shed as singles: "Burial Time" and "A Butchery Improved" both with a brutal force to be reckoned with, "Enter Hell" is the opening track of this album and the guitars sounds blazing, sharp, Gustafsson does a bestial exhibition of his skills behind the drums, lovely guitar solo that remind me bands like Dismember or Hypocrisy, right after this cut comes "Burial Time" in the same vein as the previous one, "Remember the Flesh" come to fuse cohesive groove riff, fiercely fast pace to drive you to mid pace, vocals are powerful grunts that drills through your ears, "Brain Cell Holocaust" display a versatile band at songwriting, "Forensic Nightmare" it's brutal relentless shredding guitars follow by strong blast beats a fast pace track, "Order of the Chainsaw" is a deeper cut, a little slower than the rest of the album, but blends perfect and does not disturb the flow, here they gave us crushing riff that feels dense, thick and obscure, "Dead and Impaled" is the closing track and even at this point they handle to keep it interesting, heavy and burning as hell. 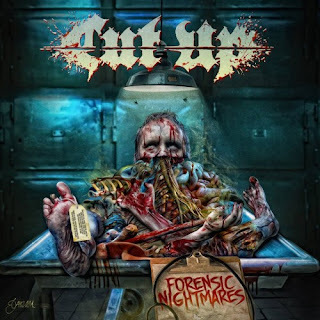 Cut Up were capable to create an extremely malicious mixture of violent, groovy and grinding death metal splattered with merciless, fierceness and vile instincts that put them as one of the most enjoyable acts to listen for, so... what are you waiting for? go grab their album and add it to your playlist.